A celebration of professional authors, musicians and artists will be held at Viera/Suntree Library on February 13 between 1 and 3 pm highlighting local talent from Brevard and Indian River counties. 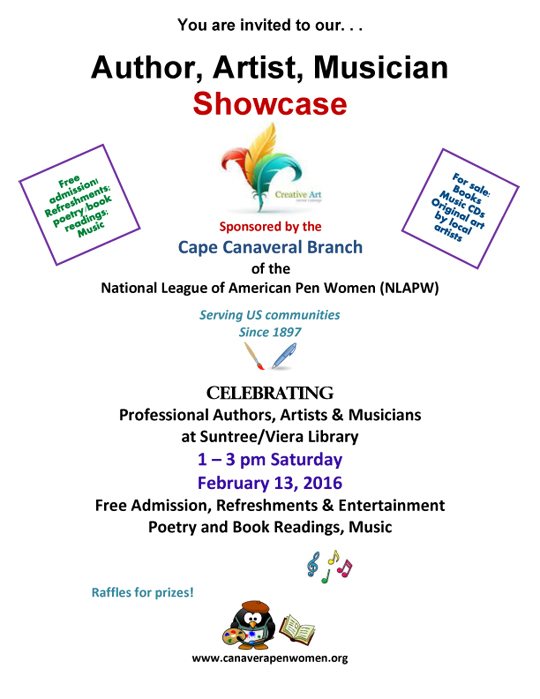 Arranged by the Cape Canaveral Pen Women (CCPW), the showcase will feature poetry and book readings, musical performances as well as a chance to meet the scribes, troubadours and artisans who are members of the CCPW, a branch of the National League of American Pen Women. Featured authors who will be on hand to discuss their books include Fay Picardi, Mia Crews, Kay Williamson and Anna Flowers. Picardi penned Simonetta, the subject of Botticelli’s Venus, a fascinating historical fiction, which provides a glimpse into the Italian court and the mysterious woman who lived in Renaissance Florence. Crews and co-author Karlene Conroy, will discuss their hilarious book Last Stop Paradise about coping in the sandwich generation. For budding authors, Crews will also have on hand her CD How to Publish on CreateSpace and Kindle for Free. Williamson, a teacher turned mystery writer, artist and songwriter, will feature her numerous well-crafted mystery novels. Anna Flowers will have her updated riveting book focusing on the real-life mystery surrounding the shocking story of Sue Logue, her lover Strom Thurmond and a South Carolina blood feud. Artist Rosemary Brofo, president of the Vero Beach Pen Women, will also be on hand to highlight Two Little Girls from Kissimmee, her new illustrated book, a memoir of Central Florida during World War II. In addition, well-known poet JoAnna O'Keefe will introduce her song America at the Crossroads, now on CD, while Fay Picardi will read poetry. Musician/composer Melany Perkins, specializing in children’s music, will play guitar and sing from her CD Animalopolis, which received a Parents Choice award. Admission is free and the event will include raffles to win the artists’ work as well as refreshments. Books, CDs and professional artists work will also be available for sale.